Not the sexiest title, I grant you, but important stuff, nevertheless. Those of us interested in just how close we are to full employment like to track the more comprehensive “u6” rate, aka, “underemployment.” It includes all the unemployed, but also the millions of involuntary part-timers (IPT)—who are, quite literally, underemployed—plus a small subset of those out of the labor market who might be willing to work if there were more good opportunities available. Especially because IPT has been so elevated in this recovery, and because some special factors, like depressed labor force participation, have led to a downward bias of the unemployment rate, u6 is worth watching closely. As you see below, u6 rose more in the Great Recession and has fallen faster in the expansion than the official rate. Now, for reasons I’ll explain, it’s necessary to guesstimate to the “natural rate” of unemployment, i.e., the unemployment rate consistent with stable prices. The Fed thinks it’s about 5% which is where we are now, ergo, they’re getting ready to raise rates. But I think that these days, it’s better to gauge slack using u6, which last clocked in at 9.8%. But where is that relative to the natural rate of underemployment? The (justifiably) influential macro team at Goldman Sachs believes that the natural rate for u6, call it u6*, is 9%. That’s about where u6 stood at the end of the last expansion (late 2007) when the official rate was at 5%, so not an unreasonable guess. OTOH, as you can see in the figure, u6 was around 7% at the end of the 2000s expansion, when the official rate was around 4% (and inflation was perfectly well behaved, ftr). There are reasons to believe the “natural rate” is higher today than it was back then—certainly productivity and thus potential growth are lower now. And, of course, there are good reasons not to truck in this whole “natural rate” business at all; there’s no reliable way to nail it down, it moves around, and economists invariably tend to pitch it too high, at great cost to those who depend on truly full employment. But here’s why it’s important: the Taylor Rule. This is the rule that says at least one Taylor Swift hit must be on pop radio at any given time (whoops—sorry—just a little whining from a chauffeur whose teenagers insist on controlling the radio). The other Taylor Rule is one of the methods the Fed employs to decide whether the interest rate they control needs to be raised, lowered, or left alone. There are many variations of Taylor rules, and I’ll let you Google them to your heart’s content. They’re a touch controversial right now because House Republicans are trying to pass legislation to make the Fed follow some version of the rule, a terrible idea that Fed chair Yellen has inveighed against. Like I said, the rule is but one input and there are too many variants to reliably count on it to give anything more than a range of impressionistic answers as to where the Fed funds rate (ffr) should be set. The rule is just a formula that takes data on inflation and slack and spits out an ffr. If you use the version Yellen describes here in footnote #5, and you plug in u6 instead of the official rate for slack, as I strongly think you should, you have to, as part of the formula, guesstimate u6* (the natural rate for u6). So that’s what I did, using a few different methods (data available upon request). 1) regress u6 on Levin’s comprehensive slack variable, such that u6*=the intercept term, i.e., underemployment when slack=0. 2) regress u6 on the difference between the unemployment rate and the CBOs natural rate; the intercept is again the natural rate. 3) same as #2 but just plug in 4.5% for CBO’s natural rate, under the assumption that they peg it too damn high. The table shows the results, using Yellen’s ftnt 5 version of the Taylor rule, and the most recent observation of year/year core PCE inflation (1.3%). If, like the GS team, you think u6* is 9%, the rule returns 0.17% which is about where the Fed’s likely heading in a few weeks, when they raise the ffr by 25 basis points. * If you think u6* is something less than that, as I do–my prefered u6* is 8.5%–you’d be in less of a rush to get started with your “normalization campaign” as the rule says the economy still needs a negative real rate to get back to full employment. But these differences are small and there are many sensitive assumptions built into the calculations. As I’ve said here re Fed liftoff plans, go ahead and raise a tiny bit if you must. What matters now is the path of future increases which, if we are to get to and stay at truly full employment, should surely be shallow and driven by the extent to which income and wage growth are reaching those who have heretofore been left behind. *Update: The GS team now pegs u6* at 8.7%, slightly above my preferred estimate (no link, sorry). Nice move, GS! Share the post "What is the “natural rate” for u6?" 11 comments in reply to "What is the “natural rate” for u6?" Small quibble from someone who may or may not be an insider: The only thing that makes the U3 rate the “official” rate is its use by business and political journalists and commentators. The rest of us are content to look at all six measures, as well as several other metrics, to glean different perspectives on the labor market. This shouldn’t be taken as a specific criticism of you, Jared, as you’ve spent years talking up alternate metrics to U3, but it’s frustrating to see the myth that there is something special and unique about U3 perpetuated. The Taylor rule, NAIRU, and the Phillips curve, all strike me a way for liberal economists to stick it to the working man, without being quite as obvious as the conservative. In pretending to be their friend and look out for the worker’s interests, they do more damage by gaining their confidence and support, and thus co-opting the possibility of real change. If I said the 1% keeps unemployment higher than need be, even at the expense of a slower economy, and lower GDP, in order to prevent labor from regaining power, you might shake your head and say, why would they do that? (Krugman asks constantly). As long as the 1% keeps 20% of national income (twice the level 35 years ago), a point of growth coming off of GDP is of no matter because they have enough money, way more than enough. They don’t need any more money. Not one cent more. It is the comparative wealth that is important and which keeps them in power. Play all you want with the Taylor rule, NAIRU, and the Phillips curve. You’re keeping the reserve army of labor. Also, half the economy is still in a recession, and the bottom quarter is in a depression (levels of unemployment, income, etc). Deal with that first. 1/3 of the population (college graduates) have an unemployment rate of 2.5% and labor participation of 75%. That’s a totally separate world in which they live. Half the economy is in recession? Nope, look again. Think again. You aren’t trying. 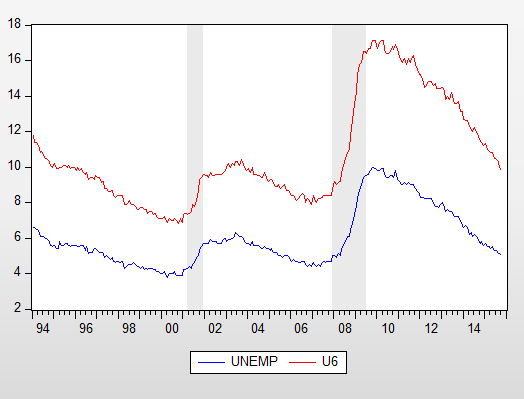 Even underemployment is diminishing. For the college educated 1/3 of the economy, underemployment peaked at 9% April 2010. The next tier of education with some college was at 9.5% as of September 2015. Less than high school is at 20%. Less than high school is less than 10% of the labor force with a 45% labor participation rate. High school graduates are another 25% and they are at 13.5% underemployment. The worst years of the Great Depression experienced unemployment between 15% and 20%. How to compare Depression unemployment with Great Recession underemployment is a bit nuanced. But I would speculate they are closer then you might think since without any safety net and being a poorer society in general, there was less choice about looking for work. Women were not in the workforce, but poor farmers not making any money weren’t considered unemployed. Overall, I stand by my statement. There are college educated enjoying recovery. Less than college educated still mired in recession. Finally, there is a significant segment that include all manner of less fortunate workers, including immigrants, illegal immigrants, minorities, people in poor economic zones, and also other people with obstacles to employment even in the best of times, and they are living in a depressed economic world. The Fed proved under Volker that it has the capacity to rein in excess inflation. I say take the risk of waiting too long for unemployment hit rock bottom before raising rates. If we do, in fact, overshoot the mark, workers will benefit, debtors will benefit, and we’ll be able to credibly change the inflation target from 2% up to 4%. This will also allow even the Fed to benefit by making its mandates easier to accomplish in the future given that Congress has proven itself utterly unwilling to do its part by using fiscal policy to ease the pain of recession. However it was originally developed, the rules for the U-3 sure seem to put a thumb on the scale in favor of accepting a high number of people out of work. The U-3 requires an “active” search within the last four weeks, and the definition of “active” is fairly stringent: consulting newspaper ads or internet services don’t count. People who still want a job but have exhausted places they could “apply” for a job on a cold-call basis are deemed out of the labor force and therefore not unemployed because they have decided to do something constructive while continuing to look for signs that their field might be opening up. Especially questionable seems to be the exclusion of internet searches, since those databases are now quite thorough and that would seem to be the best way to get leads in this era. The formula for U-3 is really quite disrespectful of what people say they want. Surely those who say they want a job consider themselves to be unemployed, but professional economists in their superior wisdom say, “No you’re not.” Not surprisingly, that exclusion dictated by professional economists tends to push the Fed to slow growth and raise rates to the benefit of creditors over debtors. This artificial definition of official unemployment — at a time when the internet becomes the best way to do job searching — is one possible reason why U-3 looks low when virtually every other way of looking at the labor market shows anything but full employment. I think that graph is deceptive in suggesting that U-6 has been coming down “faster” than U-3. In fact, the ratio of U-3 divided by U-6 has been at historical lows, at or barely above 50%. There were four earlier months (between January 1996 and December 2003) when the U-6 was 9.8%, and the U-3 in those months were, respectively, 5.6%, 5.5%, 6.0% and 5.7%. Those U-3/U-6 ratios ranged from 56% to 61%. As to whether a 9.8 U-6 could be considered “full employment,” we should not forget that for 12 years between 1996 and 2008, U-6 was below 9.8 in 129 out of 144 months; for 96 of those months, or two-thirds of the months over a 12-year span, it was below 9.0%; for over three consecutive years (38 months) from 1998 to 2001, the U-6 was below 8.0%. If 12 years isn’t enough to establish a pattern, the theory for picking something different better be damned strong. As far as I can tell, it isn’t. The entire normal rate of unemployment seems suspect in what appears to be a new equilibrium with excess labor and capital. We should risk proving that we can create inflation through over employment before even thinking about higher rates. Otherwise we may be acting on ideas subsequent economists may show to be myths.